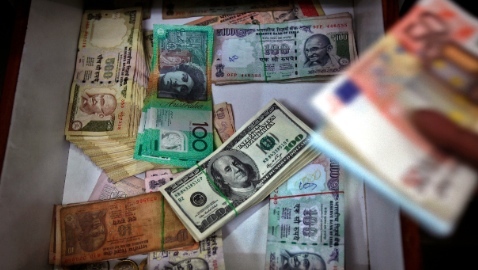 The Indian rupee on Thursday rose spectacularly by 158 paise to trade at over one-month high of 61.80 against the dollar at the Interbank Foreign Exchange market. The Indian currency was bolstered by hopes of increased capital inflows after the US Federal Reserve’s surprise decision to keep its stimulus programme intact. Local traders said besides expectations of increased capital inflows, the dollar’s weakness against other currencies overseas boosted the rupee’s sentiment. Against a basket of currencies, the dollar lost 1.1 percent in under 24 hours to hit its lowest since February. Meanwhile, stock markets were up by nearly 3 per cent in the opening trade. The BSE benchmark index soared by 574.13 points, or 2.88 per cent, to 20,536.29, while National Stock Exchange’s Nifty rose by 183.65 points, or 3.11 per cent to 6,083.10 in opening trade. In further good cheer for the Indian economy, a new Deutsche Bank report said on Wednesday that foreign institutional investors (FIIs) have recouped around 25 per cent of the capital flight seen over the June-August period, when India witnessed a sharp bout of FII outflows of $4 billion.